Well it’s been awhile since I’ve done a proper course recap! I apologize for the lack of content lately, I’ve been busy with my primary business putting on our two year anniversary sale. But now that we’re through with that, time to focus on some golf for a change! Last week the day after the sale ended I invited my mom up to Portland to head out to one of the top public courses in Portland, The Reserve Golf Club and Vineyards. The Reserve is an interesting property. The club is semi private and features two courses, the North and the South. For the first two weeks of the month the North is Private and then the second two weeks it switches so the other is private. If I were a member at a club, I this would actually be a pretty nice benefit in my book – as long as you don’t care as much about the exclusivity of having your own private course all the time. As far as courses are concerned, considering the Reserve lies on a pretty tight and flat piece of property, they are actually quite different. The North Course is much shorter and is more links style with large mounds, and wetlands to avoid – while the South course is longer and has sand…lots and lots of sand. Since it was the first of the month we got to play the South Course, which is pretty widely regarded as the better of the two. It’s held a number of semi-big tournaments over the years and is always a fun course to get out and play. I’ve played each of the courses at the Reserve twice, and both were a couple years ago before I started this quest to play all of the top courses in the country. This go around, I’ll be honest, I was slightly (only slightly), disappointed. We get to the first tee, and there’s a maintenance guy standing right in the middle of the fairway near my landing zone. As we get up to the ball a giant tractor marched all the way down the fairway punching holes, didn’t stop or idle for our shots, just made about as much noise as you possibly could on a golf course. The offending tractor on the first hole. This was a common theme across the front nine, and considering green fees in the summer are upwards of $75/round, this seemed pretty unacceptable to me. The fairways were in ok condition, but luckily the greens and sand were immaculate. On a course with upwards of 120 bunkers you’d better have light and fluffy sand that’s actually playable, otherwise you’ll have a lot of unhappy customers – fortunately for us, everything was great quality. Third hole and a hint of the sand that’s to come. The greens were in tournament shape and rolled fast and true, which I’ve always found to be the case when playing out there. The front 9 of the South Course, while very nice and a solid layout, I found relatively uninteresting. Because the property is relatively tight, there were quite a few holes that kind of lapped back and forth a bit, which slightly took away from an otherwise beautiful piece of property. The back 9 however was much different. There were trees, water features, and generally more interesting holes than the front. It also doesn’t hurt that I played much better on the back after racking up more doubles on the front than I’d had in a long time. I’ve been very fortunate to play some world class courses this year, and before this, I’d always kind of thought the Reserve was on the same level. Now going back and replaying it, I was a little bit disappointed. That being said, my mom came out and was absolutely amazed. The grounds were well manicured, the clubhouse is beautiful, and it’s overall a fantastic place to spend the day. Seeing her reaction brought me back down to Earth a little bit. When you get spoiled playing at places like Pronghorn or Black Rock, it can be easy to become overly judgmental when a place doesn’t live up to those expectations. The reality is, the vast majority of golf courses don’t, and for a local semi-private course in Portland, The Reserve is a great place to spend the afternoon. Absolutely, both courses are worth playing, and if you can find a cheap tee time in the afternoon it becomes an even better deal. Unique double greens are used in a couple places. This is the 11th on the left and 17th on the right. 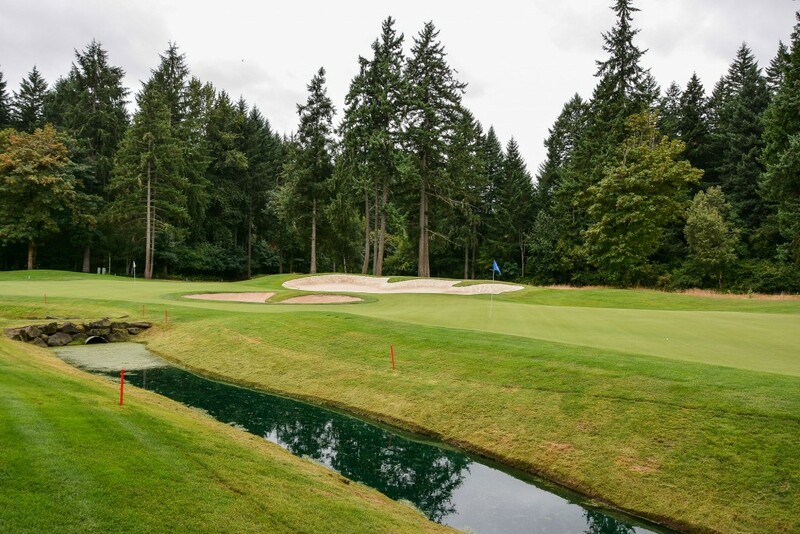 I’ve been told the Reserve is also one of, if not the best draining course in the city, so it’s a great option if you want to get out and play in the rainier months. That said, if you want to make a golf outing, but don’t want to play the steep prices of Pumpkin Ridge, I’d consider also looking at The Resort at the Mountain. While not quite as well maintained as The Reserve, the scenery is second to none, and the vibe and experience is great. Not to mention all 3 of the 9s out there have some really memorable holes – especially Pinecone.